Dental implants are a highly successful dental procedure that can give you long-lasting results. Dental implants have revolutionized dental reconstructive surgery and have allowed patients to regain their smiles as well as their confidence. Currently, many patients and oral surgeons alike are suggesting permanent tooth replacement options like dental implants over traditional methods like dentures. As dental implant surgery becomes more efficient and common, cases of dental implant complications may become more common. Dental Reconstructive surgery with dental implants is efficient and effective, but like all procedures, dental implants carry risks and common complications. Implant complications are unlikely, and Dr. Stein prioritizes your health and each procedure with care in order to ensure the best results. For over 25 years, the number of dental implants placed yearly has steadily increased. As the length of time that dental implants have been around increases, the number of implants with some problems increases as well. These problems being encountered need to be addressed with care and expertise. What are common dental implant complications? Despite being incredibly successful and durable, some patients will experience complications during or after their procedure, especially as a result of a less skilled dentist. Dr. Stein approaches each individual case on a personal level with the most advanced technologies and procedures to guarantee the highest probability of success. If you have any dental implant problems, Dr. Stein can gladly help you treat them and restore your smile. Dental implant complications can be divided into four categories. Possible complications include inflammation or infection around the dental implant, bone loss, implant failure, or cosmetic-related dental implant complications. Peri-implant Mucositis Inflammation of only the soft gum tissues. Can be treated if found early. Precedes peri-implantitis. Peri-implantitis Further inflammation of the gums and jaw bone. Can lead to bone loss. May require surgery. Implant Failure Failure for your implant to securely bond with your gum and jaw bone. 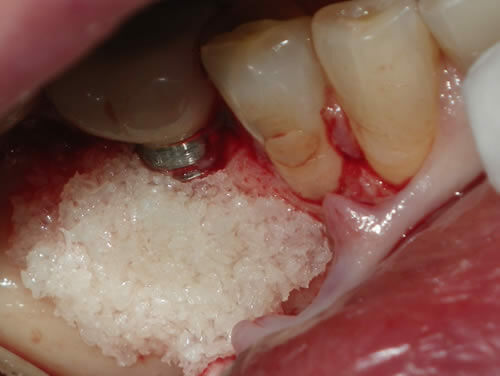 Can occur from improper placement of dental implants by inexperienced surgeons. Bone Loss Inflammation of the gums from bacteria that compromises the strength of the jaw bone. Inflammation can cause the bone surrounding your implant to dissolve. Leads to implant failure. Cosmetic Complications Any complication in your implant that causes your smile to appear less than natural. Complications include receding gums, moving implants, or implants placed at the wrong angle. What are inflammatory dental implant complications? The recession of the gum line around a dental implant is possible. Just as the gum can recede from a tooth, gum recession can occur around an implant. The bone that supports the implant, however, will usually remain despite the recession of your gum line but can still lead to complications. When your gums recede, the base of the dental implant becomes visible. The visibility of your dental implant leads to a cosmetic issue where your implants no longer look natural. On top of this, the functionality of the implant itself is compromised. The spaces between your implants, teeth, and crowns become areas where food can become trapped, which leads to general irritation, inflammation, poor dental hygiene, discoloration, or peri-implant disease. Peri-implant diseases are inflammatory conditions that affect the supporting structures around your implant, specifically the gum and bone. There are two types of these inflammatory conditions. 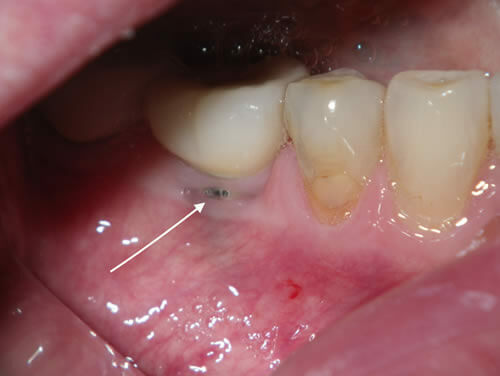 Peri-implant mucositis affects the gum tissue only and is readily treatable when detected early, but if it is not detected in its early stages, peri-implant mucositis can lead to a much more serious condition known as peri-implantitis. Early signs of peri-implant mucositis include red, swollen, irritated gums that may bleed or cause discomfort. Peri-implantitis often causes bone loss and may require surgery to correct, and peri-implantitis affects the stability of your implant. Some cosmetic gum problems and cases of gum recession can be solved by simply changing the crown on top of your implant, but other cases may require multiple surgical or restorative treatments to restore your smile. At New York Oral & Maxillofacial Surgery, we are committed to providing you the best experience to avoid complications and creating restorative regimes to restore your smile if you have experienced any complications. What are bone loss dental implant complications? Inflammation of the gums mainly caused by bacteria can lead to bleeding and even bone loss. At first, this inflammation is confined to your gum line, but if it is not treated adequately in time, it can progress to the bone that surrounds your implant. Although uncommon, this inflammation can cause the bone surrounding your implant to dissolve, which poses the risk of your implant becoming unstable. There are multiple factors that can lead to a heightened potential to develop bone loss around your dental implant. Smokers are more likely to experience bone loss. Patients with osteoporosis are also at a higher risk, and patients who have had or currently have gum disease are also at a higher risk of bone loss. Habits like grinding your teeth or forgetting to brush your teeth regularly also compromise the health of your dental implants and can lead to bone loss. If the bone around the implant deteriorates enough, your implant will fail, which means that it has become unstable and moves. Many patients who experience bone loss have had their implants placed by inexperienced surgeons. Dr. Stein plans your procedure in depth prior to your visit in order to ensure you the best results and can help you treat this complication in his office. After taking an x-ray to assess your needs, Dr. Stein will approach your case on an individual level. Depending on what is the root cause of your bone loss, Dr. Stein will be able to create the most effective regime to restore your smile. What is an implant failure complication? The process of osseointegration is crucial to the success of your dental implants. Osseointegration is the process in which your dental implants securely anchor to your gum and living bone. Over your initial healing time of 4-6 months, your gums and jaw bone with integrate with your implant, which creates a secure, healthy bond that enables your implants to work successfully. An unsuccessful osseointegration usually stems from your jaw bone failing to fuse to your implant. If your implant shifts or moves, your implant is considered to have failed. A failed dental implant can stem from several causes, including incorrect positioning, accidents, or insufficient bone density. Dr. Stein assesses various aspects of your health like gum loss and bone density in order to appropriately treat you. If you have insufficient bone density, Dr. Stein may perform a bone graft or choose another course of action to avoid these complications. With his expertise and experience of placing thousands of dental implants, Dr. Stein knows exactly how to approach your needs to avoid any complications. If you have experienced an implant failure from another oral surgeon, Dr. Stein is more than happy to sit down with you to work out a restorative dental regime that will have you smiling again soon. What are cosmetic dental implant complications? There are numerous cosmetic dental implant complications, such as gum recession, shifting of implants, or improper angling of the implant during your procedure. The placement of your implant during your procedure must be done with extreme precision and planning to provide the most natural and successful result. The improper placement of dental implants can lead to gum recession, bone loss, and even implant failure. Exposed implants are a product of gum recession, which can lead to a less confident smile. Bone loss from the improper placement of a dental implant means that the dental implant can fail. Cosmetic issues can range from minor to severe dental implant complications, but Dr. Stein can plan the best course of action to address all of your needs. What can I do about dental implant complications? At New York Oral & Maxillofacial Surgery, we approach each dental implant procedure and patient with the utmost care, and Dr. Stein precisely plans each procedure for the highest probability of success. If you have experienced any dental implant problems, Dr. Stein will work with you to determine the best course of action for your individual needs, goals, and desires. Each case is unique and will be extensively planned for prior to the day of your procedure, and Dr. Stein is dedicated with providing you the safest, most effective treatments. How can I learn more about fixing dental implant complications? Dr. Stein and his staff would be happy to discuss fixing your dental implant complications with you. Please call 212-888-4760 or schedule an appointment online to arrange for a private consultation at our office.